VMWare Consultants- Experts on Server Virtualization | LG Networks, Inc.
LG Networks, Inc is an experienced VMWare Enterprise Partner. From the desktop to the data center, you can virtualize your computing, storage and networking systems with our VMware consulting experience. From planning and design to implementation, you can rely on LG NETWORKS’s VMware consultants to give you sound advice. Our VMWare experts can help you find a virtualization solution that leverages your existing technology to increase server and other resource utilization, improve performance, increase security and minimize system downtime, and reduce the cost and complexity of delivering enterprise services. LG NETWORKS’s VMware Consulting Team combines its expertise in virtual computing with an excellent reputation in account management, product pricing and project delivery. VMWare Converter Migratons: Using custom tools that we developed, LG NETWORKS VMware consultants will assist you in importing the workloads of your physical servers into virtual machines. Converter Migrations are ideal for customers involved in server consolidation or legacy migration projects. They help reduce the complexity, risk, and downtime typically associated with these kinds of projects. By eliminating the need to re-install software and configure complex application environments, Converter Migrations cut down on set-up time and deliver value on your investment in VMware software in the shortest timeframe possible. VMware Workstation is powerful desktop virtualization software for software developers/testers and enterprise IT professionals that runs multiple operating systems simultaneously on a single PC. Users can run Windows, Linux, NetWare, or Solaris x86 in fully networked, portable virtual machines – no rebooting or hard drive partitioning required. VMware Workstation delivers excellent performance and advanced features such as memory optimization and the ability to manage multi-tier configurations and multiple snapshots. VMware ACE gives security administrators the ability to lock down PC endpoints and protect critical company resources against the risks presented by unmanaged PCs. With VMware ACE, security administrators package an IT-managed PC within a secured virtual machine and deploy it to an unmanaged physical PC. Once installed, VMware ACE offers complete control of the hardware configuration and networking capabilities of an unmanaged PC, transforming it into an IT-compliant PC endpoint. With VMware Virtual Desktop infrastructure (VDI), companies can host individual desktops inside virtual machines that are running in their data center. Users access these desktops remotely from a PC or a thin client using a remote display protocol. Since applications are managed centrally at the corporate data center, organizations gain better control over their desktops. Installations, upgrades, patches and backups can be done with more confidence without user intervention. VMware P2V Assistant is an enterprise-class migration tool that transforms an image of an existing physical system into a VMware virtual machine. This easy-to-use market- proven tool enables fast and reliable physical to virtual machine migration for heterogeneous Windows systems ranging from Windows NT 4 to Windows Server 2008..
Increase hardware utilization and reduce hardware requirements with server consolidation ratios commonly exceeding ten virtual machines per physical processor. Extend powerful VMware Infrastructure 3 capabilities such as business continuity and disaster recovery to your desktops. Streamline desktop management to reduce operating costs and increase control. Deliver complete desktop environments with greater application compatibility. Now with the new VMware Virtual Desktop Manage2 â€” For simplified management and secure provisioning of virtual desktops. VMware VDI is an integrated desktop virtualization solution that delivers enterprise-class control and manageability with a familiar user experience. VMware VDI, built on VMware’s industry leading and proven virtualization platform, provides new levels of efficiency and reliability for your virtual desktop environment. 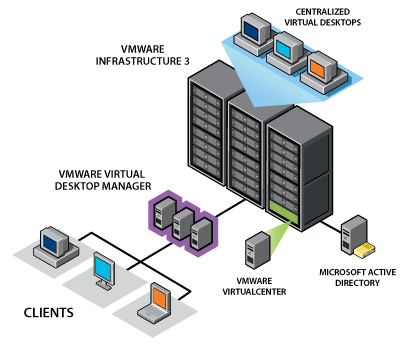 With VMware VDI, you get the proven VMware Infrastructure 3 software along with VMware Virtual Desktop Manager (VDM), an enterprise-class desktop management server that securely connects users to virtual desktops in the data center and provides an easy to use web-based interface to manage the centralized environment. VMware VDI provides users with desktop business continuity, high availability and disaster recovery capabilities that until now were available only for mission-critical server applications. Organizations worldwide use VMware VDI to streamline desktop management, increase security, and reduce costs. Using VMware VDI, the time it takes to deploy a desktop is typically reduced to minutes, optimizing the value of IT resources and getting end users productive faster. VMware VDM is a flexible and intuitive desktop management server enabling IT administrators to quickly provision and tightly control user access. With these operational and security savings, customers realize a significant return on investment from their VMware VDI deployments. With VMware VDI, end users get a complete, unmodified virtual desktop that behaves just like a normal PC. There is no change to the applications or desktop environment, no application sharing and no retraining required. Administrators can allow users to install applications, customize their desktop environment and use local printers and USB devices. Users also get better support with VMware VDI because Help Desk technicians can perform tasks in the data center that would normally require an in-person visit. Create and manage a library of commonly used configurations and dynamically provision them in seconds with a simple mouse click. VMware Lab Manager gives users on-demand access to machines and systems they need – while leaving IT in administrative control – all while achieving significant savings through reduced server, storage, and provisioning costs. Automate the setup, capture, storage and sharing of multi-machine system configurations with VMware Lab Manager. With its shared image library and shared pool of virtualized servers, VMware Lab Manager lets you efficiently store and share multi-machine configurations across teams and geographies. Eliminate the painstaking hours-long process of gathering machines, installing operating systems, installing and configuring applications and establishing inter-machine connections. With a single click, you can provision multi-tier systems nearly instantly with VMware Lab Manager. You can also give users self-service access to the image library, allowing them to fulfill their own provisioning needs while leaving IT in control of user management, storage quotas and server deployment policies achieving the best of both worlds. To find out how LG NETWORKS’s VMware consultants can help you with VMware Virtual Server technology, call our Server Virtualization consulting team at 972-528-6546.